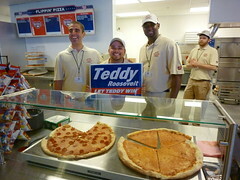 Hard Times Cafe | Let Teddy Win! The new-look Nationals begin their first extended homestand at Nationals Park tomorrow, bringing a 4-5 record and a renewed sense of confidence to face the Philadelphia Phillies and Milwaukee Brewers beginning Tuesday night. 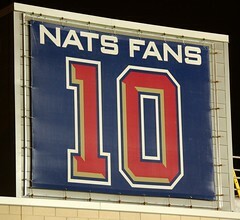 With recently departed team president Stan Kasten officially out of the way, the Nationals Marketing department appears to have gotten its act together for 2011. As we first saw when the new uniforms were announced, and observed on opening day, the team’s cacophony of colors, logos, and slogans has been wisely narrowed to a simple focus on the “Curly W” and the color red. Yes, the seats are still painted blue, but that remains the exception as the curly W and the new, brighter red have taken over the flags, banners, uniforms, scoreboard, and ad campaigns for the team. For a team still building its identity, it’s a welcome evolution of the Nationals brand. If you are an official citizen of Natstown, it appears that your passport will not be renewed. Every new season brings a few changes to the complement of “down time” distractions for the casual fan. Among those is the player’s annual selection of personal walk-up music. If you’re wondering why you’re hearing Guns n Roses and Metallica at Nationals Park, take note. Some of the team’s newest players have brought a little different edge along with their walk-up themes. Most front-and-center is the addition of radio personality Sarah Fraser to the in-stadium entertainment crew. As I wrote previously, I think she’s a real upgrade and hope readers agree. 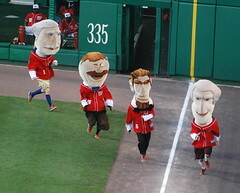 Most exciting to fans of the presidents race may be the return of the “classic” racing presidents. Last year, during the All Star Break, the presidents received a significant facelift, with no explanation offered by the team. It was the last we’d seen of the original, more menacing-looking presidents — until now. The “classic” presidents reappeared at this year’s auditions, and on opening day reclaimed their position as regulars at Nationals home games. Meanwhile, it appears that the “new look” presidents have been relegated to emergency backup and other command appearances. New casual seating areas have been added outside the Red Loft, near the Miller Scoreboard Walk, and behind the centerfield plaza, in what was formerly the Kids Zone. 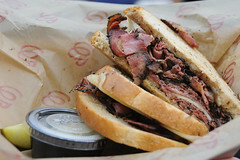 Pastrami at Nationals Park? For the fourth time in as many years, the Taste of the Majors stands have been revamped, but the latest version of the menu is the truest to the original concept — with specialties from around the Nationals League East: a Philly hoagie, Atlanta Chicken and Waffle, Miami cuban sandwich, and from New York, that grilled pastrami on rye. I can report that the latter was made with authentic Romanian pastrami and swiss, but despite coming right off the grill, was cold as ice. 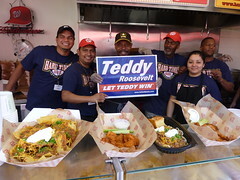 Fans of the Rough Rider are mourning the elimination of Teddy’s Barbeque, but for a limited time, the popular stand has reemerged in a tent at the Miller Scoreboard Walk. You can get pulled pork and pulled chicken, but alas, no Rough Rider. The tent will disappear soon, as soon as New York’s Blue Smoke, Shake Shack, Box Frites, and El Verano open behind the Scoreboard Walk. 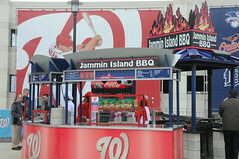 Also new to the scoreboard walk is Jammin’ Island BBQ, adjacent to the Red Loft, featuring jerk chicken and jerk ribs cooked on an open grill. The menu mirrors some new options being offered to Club and Suite ticketholders in the Stars & Stripes Club, but it’s pricey for an outfield stand, with combo platters costing as much as $16.00. Other new items at the Stars & Stripes Club include barbeque chicken nachos, braised short ribs, sweet potato fries, pork wingettes, and fish & chips. 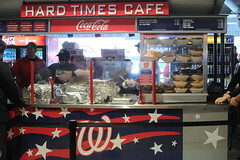 Nationals Park regulars know that the most reliably speedy food line can always be found at Hard Times Cafe in the otherwise busy left field concourse. Along with Budweiser, two other long-time sponsors — NJ’s Curly W Pretzels and Giffords Ice Cream — appear to have completely disappeared from Nationals Park, leaving the Ben’s Chili Bowl Half Smoke as the only remaining local signature item (sorry Hard Times, your chili recipe is from Cincinnati). 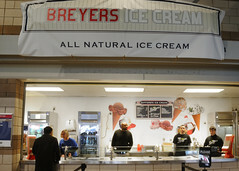 The former Giffords stand has been replaced by Breyers Ice Cream, which features a knockout Caramel Cookie Dough, but alas, no more milkshakes. 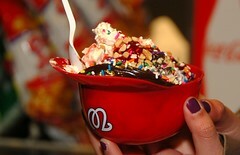 There is one bit of good news for Nats fans looking for a local treat. The popular but elusive DC food truck District Taco has just been awarded a license by the city to park on the street near the Nationals Park centerfield gates on game days. 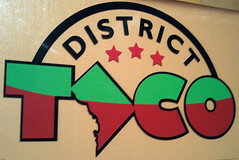 District Taco offers outstanding homemade tacos, burritos, and quesadillas that put Chipotle to shame. The Nationals do allow outside food, as long as it’s packaged in a single serving soft-sided container (no hard plastics). Let’s hope the line at District Taco isn’t too long. Race photo courtesy of Flickr member afagen. When the Washington Nationals brought in the Levy Restaurant group to replace Centerplate a year ago, expectations were high for a major improvement in concession variety and service. Perhaps they needed a year to get their bearings, because Levy has followed the incremental changes of 2009 with a number of very large wholesale changes for the 2010 season that begins today at Nationals Park. No more Papa Johns. Since RFK days, Nats fans — especially Nats fans with kids — have suffered with tiny, doughy, Papa John’s mini pizzas, while Club level ticketholders enjoyed the option of Flippin’ Pizza slices. Thankfully, Papa Johns has been banished from Nationals Park, replaced by Flippin Pizza stands selling actual slices on every level of the Park (behind Sections 115, 214, and 311). Victory Knot Pretzel. Only available in the Red Loft, this popular item imported from other stadiums where Levy runs concessions is a 2 pound pretzel in a pizza box with three sauces for dipping — a sweet cinnamon creme, a spicy chipotle honey mustard, and savory beer cheese. You definitely want to share this item. Healthy Cart. Give the Nats high marks for listening and trying. Fans on restricted diets, or who just want to eat healthy — even at a ball park — will find gluten free items, chopped vegetable salads, low fat wraps, and yogurt parfaits at this cart which moved to a better spot on the very busy main concourse behind the 3rd base stands. Alas, on Saturday afternoon, when the lines were 15 minutes deep at every concession stand from hot dogs to beer, the Healthy Cart was the only visible vendor in the Park with no waiting. Ridiculous waits. You really want to cut these people some slack since it’s the beginning of the season, but 2 years of experience tells us not to chalk this up to “working the bugs out.” As in previous years, we saw people reach the front of the line and still have to wait 5 minutes for simple food orders while a more-than-capacity staff stood around waiting for the next guy to fill the order. Really, people. 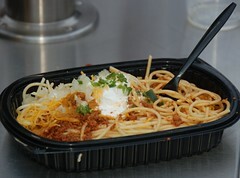 The limited menu at your food stand is designed to keep things efficient and fast. So why do I wait several minutes for a hot dog after I’ve reached the front of the line? A notable exception continues to be the Hard Times Cafe concession, where every employee seems to understand why they are there, and the line always flies. Signage.The menu signage continues to prioritize adherence to corporate design standards over actual usefulness. 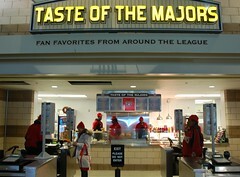 The reimagined Taste of the Majors stand is a case in point. Gone are the wonderful garlic fries and other goodies from major league parks. Now pretty much all they sell is foot-long hot dogs. The menu, unfortunately, lists “DC Dog,” “Phillies Dog,” “Braves Dog,” “Mets Dog”… You can wait in line for 15 minutes to get to the front before finding out what the difference is between these various foot longs. By the 4th inning of the exhibition game, the staff had already given up on explaining the menu, and was just asking people when they got to the front what they wanted on their hot dogs. Bottomless popcorn. A new gimmick this year is the Bottomless Popcorn available at any Nats Dog stand. For $5.75, you can get a huge bucket of popcorn — enough to make anybody sick. For $7.00, you can get the “Bottomless Popcorn,” which comes with free refills throughout the game. The catch? You can keep coming back for refills, but the Bottomless bucket is about 1/3 the size of the regular-sized bucket. Is this a smart way to please your customers and keep lines short? Adding insult to injury: my sister just asked for the smallest size popcorn, and was sold the bottomless variety. The Chicken and Waffle Sandwich. OK, I’ll admit I haven’t tried it, but I really am scared of this thing. Available at the new Change Up Chicken stand behind Section 130 on the main concourse, it features fried chicken on top of waffles, covered in syrup. Defibrillator not included. Running out of food. When you charge $11 for a sandwich or $9 for a hot dog, I assume your margins are high enough to account for a little waste, so it’s really frustrating when you run out of food in the 5th inning. The Dupont Deli behind section 227 used to have some very nice salads, but notoriously was supplied with only 4 or 5 of them to last the whole game. This year, the salads have been replaced with hot panini sandwiches — grilled cheese, italian, or turkey. They were out of grilled cheese before Saturday’s game even started. Blogger Chris Needham has has hung up his keyboard after almost 4 years at the helm of Capitol Punishment. Chris’s blog was required daily reading by every Nationals blogger, beat writer, and team executive (not necessarily in that order). This is going to really sink in the next time Jimbo pulls the trigger on a trade, when the rest of us will be flailing around looking for thoughtful, well-researched analysis. 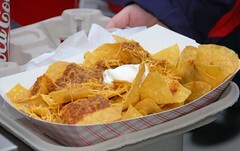 Chris, I raise a Hard Times chili nacho in your honor. You were great reading — a valuable and informed alternate perspective that will sorely be missed. I know it’s just one game, but a few things about the opening day experience at Nationals Park left me quite hopeful about the notion that this is where I’ll be watching baseball games for the rest of my life. #5: Big Cup Holders. The team’s food policy states that you can bring 1-liter bottles of water into Nationals Park. Not being a soda guy, I picked up a case of 1-liter water bottles last week in preparation for the season. As you can see, that big 1 liter kahuna fits perfectly in the new cupholders. Thankfully, my seat actually has a cupholder. Some seats did not, but that’s another story for another day. #4: Four-Way Chili. 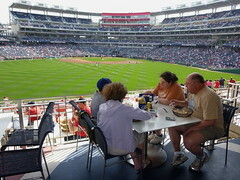 Savvy Nationals fans back in the 2006 season at RFK Stadium knew how to find their way to the 300-level terrace food court, where Hard Times Cafe had a brief run as the food vendor of choice for the discerning palate. Now Hard Times Cafe is back at the new Nationals Park, serving fine Chili Nachos and “Chili Mac,” known to true devotees of Cincinnati chili as a “4 way” (chili, spaghetti, cheese, and onions). 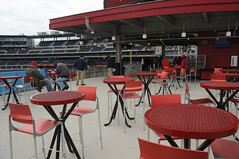 You’ll find Hard Times Cafe at Nationals Park next to Red, Hot & Blue in the left field food court. #3: Helmut Sundaes. One of the great injustices of the past 3 years is that I’ve been taking my kids to major league baseball games without buying them helmut sundaes. Maybe it’s me, but for a kid, helmut sundaes are as much as part of the sport as the 7th inning stretch. Now at Nationals Park, we finally have the real deal. #2: Home Town Fans. OK call me crazy for dreaming, but opening day gave me hope that Nationals Park will deliver the best home field advantage in DC sports. Home colors, home traditions, home angles, and most importantly, home town fans. Sunday was the first Braves game I’ve been to when I didn’t hear the tomohawk chop, and when Chipper hit that homer, the place went dead silent. That’s the way it should be. 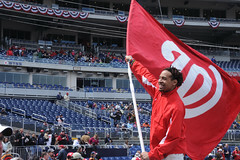 Here’s to cheering only for the home team at Nationals Park. #1: Racing Presidents (What Else?). I started this site because the racing presidents are the first truly unique hometown tradition that we can call our own. They are great fun, and give kids of all ages another reason to become Nationals fans. 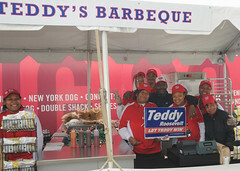 I was incredibly pleased to find that the team has made them a huge part of the fan experience at Nationals Park. 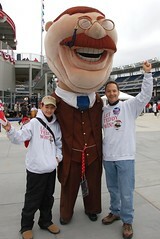 The presidents race itself has been expanded, plus Teddy, George, Tom, and Abe greeted us at the centerfield gates and reappeared near the kids zone after the 4th inning. The Nationals had no idea how big the racing presidents could be when they were first created, but it’s equally clear that they are astute enough to build on this great fan tradition.